A discovery in a research lab at the University of Central Florida is helping keep safe crews in power plants, workers with industrial gases and even aerospace engineers. Intellipigment, a colorchanging adhesive tape that detects hydrogen leaks, was created thanks to the collaboration between UCF and NASA researchers in 2010. After rigorous testing, the tape went through the technology-transfer process, several patents were issued, and the small business HySense Technology was launched to market it. After three years, international giant Nitto, Inc. acquired it. Nitto will be making and selling the tape. This process is how universities, small businesses and industry partner to bring innovation to market. It’s a long road. The Federal Laboratory Consortium for Technology Transfer is presenting the groups that collaborated on the detection tape at a national Excellence in Technology Transfer Award for its success. The team will be recognized at the organization’s national meeting in San Antonio on April 26. HySense’s story began in 2003 on Florida’s Space Coast. UCF had received a major $10 million NASA grant to lead a hydrogen-focused research project. NASA had a problem: It needed an easy-to-use, safe and effective method for detecting dangerous hydrogen leaks. The challenge was of special interest to Kennedy Space Center, home to the Space Shuttle program through 2011, when the vehicles were retired. Hydrogen is one of the most common gases used for everything from making fertilizer to launching rockets into space to manufacturing fuel cells for power generation and transportation. It is also an important component in many polymers, used to create new materials. While it’s a great element for its versatility, it is highly flammable. Hydrogen also has no scent, making its safe storage and use a priority. Ali Raissi and his team of researchers at UCF’s Florida Solar Energy Center in Cocoa worked in partnership with NASA to find an answer. Together they designed the tape, which selectively changes color in the presence of hydrogen gas. Visual detection of the gas meant that leak sources could now be quickly pinpointed for repair. NASA got its needed solution and the partners shared multiple patents for the tape. But that was just the start of the journey, which would give other industries access to this new invention. The road to market is a long one. Several companies were inquiring about the tape and wanted samples. The companies that tested the tape reported good results, but no one was willing to jump in and start manufacturing it. Enter UCF chemist and co-researcher Nahid Mohajeri, who had been thinking about launching a company to commercialize the hydrogen-detection tape. She believed in the product and saw its potential, but she wasn’t sure about becoming an entrepreneur. Then she faced a potentially life-threatening medical diagnosis. For a month, while she waited for test results, she didn’t know what her future would hold. When she received a clean bill of health, she decided to pursue her plans. She launched the startup HySense Technology in April 2013, helping the detection tape make the leap from laboratory to market. 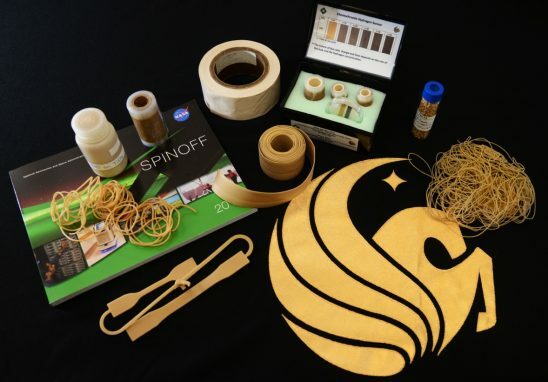 Mohajeri worked with UCF’S Office of Technology Transfer and Venture Accelerator to start manufacturing and selling what would become known as Intellipigment. Her first commercial sale was in December 2013. The specialty tape uses proprietary color-changing pigments to alert users to the exact location of a hydrogen leak. Color change occurs in a matter of seconds when hydrogen is detected. Because the tape is flexible, it can be wrapped around pipe fittings, flanges, valves, and storage and transportation vessels, expanding the potential of buyers from businesses in the petroleum industry to those producing fuel cells. Soon after the company launched, HySense won the $100,000 grand prize at the 2014 CAT5 business-plan competition sponsored by Space Florida. The same year, the company was recognized by R&D 100 Awards as one of the most technologically significant products to enter the marketplace that year. A year later, the technology transfer teams, researchers and company were recipients of the 2015 Excellence in Technology Transfer Award in the southeast region by the Federal Laboratory Consortium for Technology Transfer. It is the same group that is honoring the team next month at the national level. After only three years of successful commercialization, HySense’s hydrogen-tape assets were acquired and will be sold by the U.S. subsidiary of Nitto Denko Corporation, Nitto, Inc. to various industries. Nitto Denko Corporation is based in Japan and was founded in 1918 to produce electrical insulation materials. Since then it has become a leader in the energy materials, industrial tapes, environmental solution, optronics, and life-sciences markets. It entered the U.S. market in 1969 and provides services in the fields of electronics, automobile, aerospace, housing and construction, metal processing, alternative energies and health sciences among others. The company had net sales more than $7 billion in 2015. The Florida High Tech Corridor promotes the high tech industry and innovation of the region through partnerships that support research, marketing, workforce and entrepreneurship. Ed Schons, president of the Florida High Tech Corridor believes collaborations that lead to commercialization like this, are essential. It was truly a pleasure to have worked with Nahid Mohajeri, as her business coach, for all three years. Congratulations to HySense Technology, UCF and NASA!